Life Is Art is excited to join the Leah Arts District in the inauguration of a new arts district. With the support of Councilman Paul Hernandez and the Hialeah Mayor and City Council, we look forward to the possibility of creating a permanent and protected home for artists in Miami-Dade County. Join us as we celebrate the City of Hialeah’s new artist live / work zoning spearheaded by Councilman Paul B. Hernandez. The area near Flamingo Plaza best known for its unique thrift shops is now The Leah Arts District. E. 15th Street will be closed off for the block party. Murals By: Derick G. (Hialeah), Junk Lainez (Hialeah), Trek Six (Miami), Don Rimx (Miami), MrDheo (Portugal), Kazilla (Miami), Atomik (Miami), NM Salgar (Miami). Hialeahâ€™s Southeastern industrial corridor rose to prominence during the 1980s as one of the largest and busiest areas of production and manufacturing in Florida. As a result of modernization combined with the effects of outsourcing, the uses that were once prevalent in the area dissipated and this particular area was all but abandoned. Since that time, a medley of different uses has been incorporated into the area including a heavy presence of some of Miami-Dade Countyâ€™s most prolific thrift stores. These thrift stores have been instrumental in introducing Hialeah to an entire generation of antique lovers and artists. 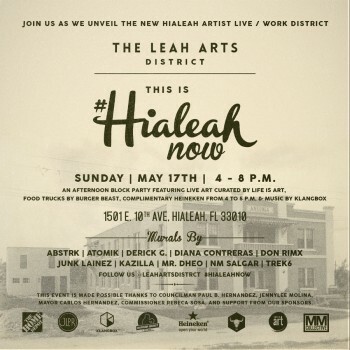 The Hialeah Artist Live/Work Overlay District, also known as The Leah Arts District, enjoys a strategic proximity to the newly proposed Hialeah Market Station development project, Miamiâ€™s artistic hubs, and other destination areas within Miami-Dade County. Because of it’s location and highly affordable price per square footage, Hialeahâ€™s new Artist Live / Work District is in a position to play a vital and important role in the artistic and cultural development of not only Hialeah, but the entire South Florida community. Follow @leahartsdistrict on Instagram for updates.